The Youth Club is an independent non-profit Charity and all of our costs are raised by ourselves. To keep our entry fees low but also cover our running costs we run a number of fundraising activities throughout the year. This includes Grant Applications, Raffles, Supermarket Bag Packing, Sponsored Half Marathon’s and Stalls at local Fetes. We also have a Local Giving page, as well as being set up on Easyfundraising and AmazonSmile to raising money when shopping online. We are always looking for ideas and support so if you can help please get in touch. You can help support us by using any of the links below. We would like to thank everyone who took part in the Green Park challenge, this event was truly a challenge in itself and was rightly postponed due to extreme weather conditions. The event was rescheduled which meant that not all those that enrolled could make the new date, however, those supporters helped us by allowing us to pass on the t shirts to allow others to participate which was great. 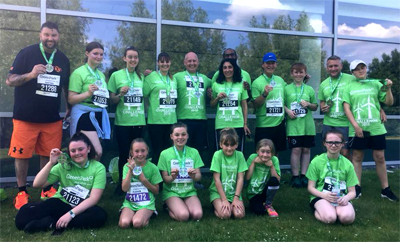 We would like to thank all the runners and all those that sponsored us, to date we have raised a wonderful amount of £476.70 and a further £150 in matched funding has been promised. Next year will be bigger and better, and we look forward to your continued support. A big thank you to you all. Many thanks to Brian who did a fantastic job of coordinating the event. We raised the fantastic amount of £624.00 in our Christmas raffle. Thanks to everyone who bought / sold tickets. In particular thank you to our fundraising committee for their effort. Thanks to the company’s and individuals who donated a raffle prize. 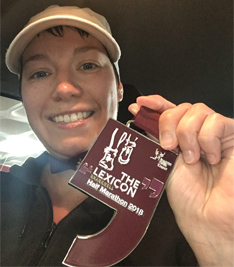 Not only does Kim volunteer on a Friday night, Chair the Management Committee, contribute to the Fundraising Committee meetings but she ran the Bracknell half marathon to raise funds for the club. Kim raised £325 and with Gift Aid it was £368.75. All of those who donated were Kim’s friends family and work colleagues.